Agroforestry is the integration of woody vegetation, crops and/or livestock on the same area of land. Trees can be inside parcels or on the boundaries (hedges). Agroforestry can be applied to all agricultural systems, in all parts of Europe. Agroforestry systems are obtained by planting trees on agricultural land or introducing agriculture in existing woodland/orchards (e.g. silvopasture). Europe has a unique heritage of traditional agroforestry systems with a high environmental and cultural value, and Europe has a high potential for innovative modern agroforestry systems developed by research centers across Europe during the last two decades. 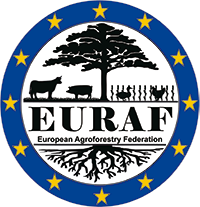 EURAF accomplished that incentives for the promotion of agroforestry plots have been introduced to the Common Agricultural Policy: Agroforestry practices are listed as Ecological Focus Areas and farmers can receive greening payments for such plots in pillar I (Reg. (EU) 1307/2013). The establishment of agroforestry plots can be supported through national or regional Rural Development Programmes in pillar II (Reg. (EU)1305/2013).